We like to celebrate and join in Halloween parties not because we are in love with vampires, monsters and witches, but because it gives the kids a chance to dress up and be imaginative, exposes them to traditions and cultures, and let us be able to laugh, bond and create happy memories as a family. 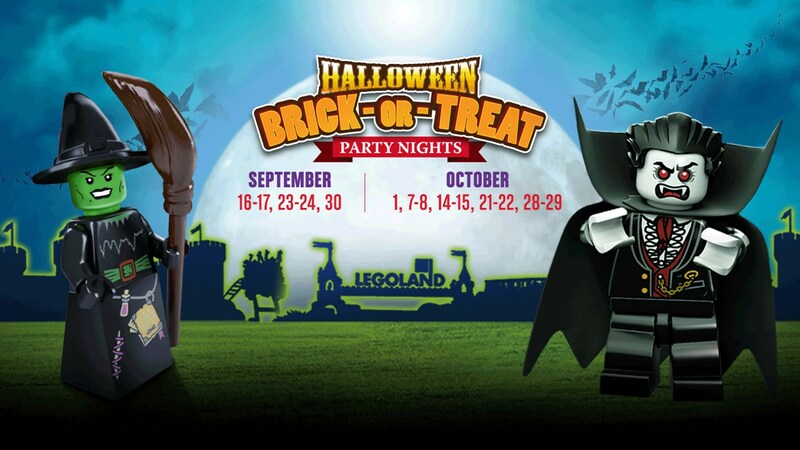 Remember we shared about the Halloween Brick-or-Treat Party Night held in LEGOLAND Malaysia last year? I still find it hard to believe that a year has passed and when we returned to this kid-friendly Halloween celebration last week, I had a 9-month-old baby snug against my chest. Yup, it was baby Asher's first time visiting LEGOLAND! As for the girls who have been here nearly a dozen times already, all I can say is they can never get tired of coming here and thankfully, their excitement, joy and zest was contagious and I was feeling just as enthusiastic as them. In fact, we went shopping for their Halloween costumes, came up with ideas to dress up each kid and got everyone all psyched for the big day. It was the first time I was travelling into Malaysia without the husband (who drove in and joined us later in the evening), and with all three kids, and I was glad that with a fair bit of nagging, we survived the WTS coach ride which took us from Singapore Flyer to LEGOLAND hotel (You can read our review of the hotel here). In this post, I'll share with you all the fun things we did and what you can expect from this year's Halloween Brick-or-Treat Party! Brick-or-Treat Party Nights take place from 4.00 pm to 9.00 pm on Fridays and Saturdays from now till end of October (30 Sep-1 Oct, 7-8 Oct, 14-15 Oct, 21-22 Oct and 28-29 Oct). Walk-up admission tickets for Brick-or-Treat Party Nights is priced at RM85 (You can book your tickets here). With admission day tickets (1-Day Theme Park ticket, 1-Day Combo ticket or 2-Day Combo ticket), entry to Brick-or-Treat Party Nights is FREE. 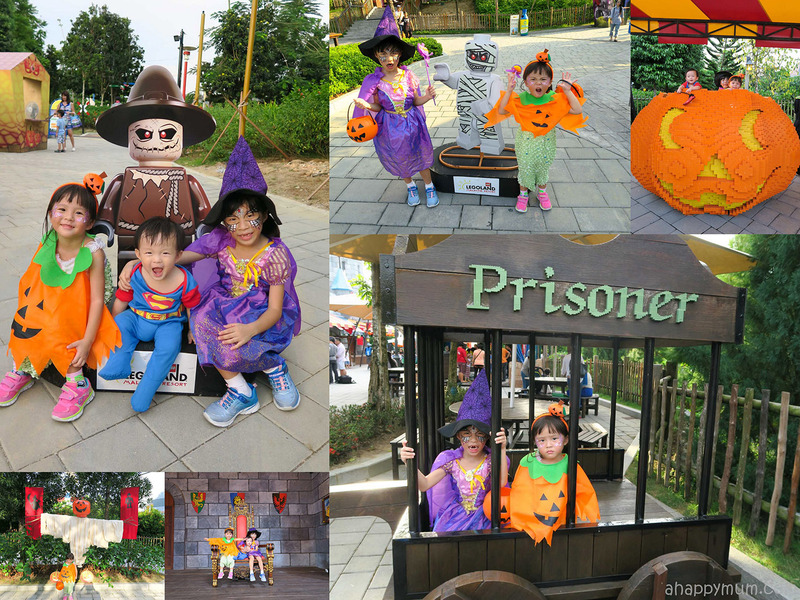 *Kids who dress up in Halloween costume on Brick-or-Treat Party Nights will get FREE admission to the Theme Park! *This is applicable for kids aged 3-11 years old and they need to be in full Halloween costume. Free admission is only applicable on the Halloween event date. 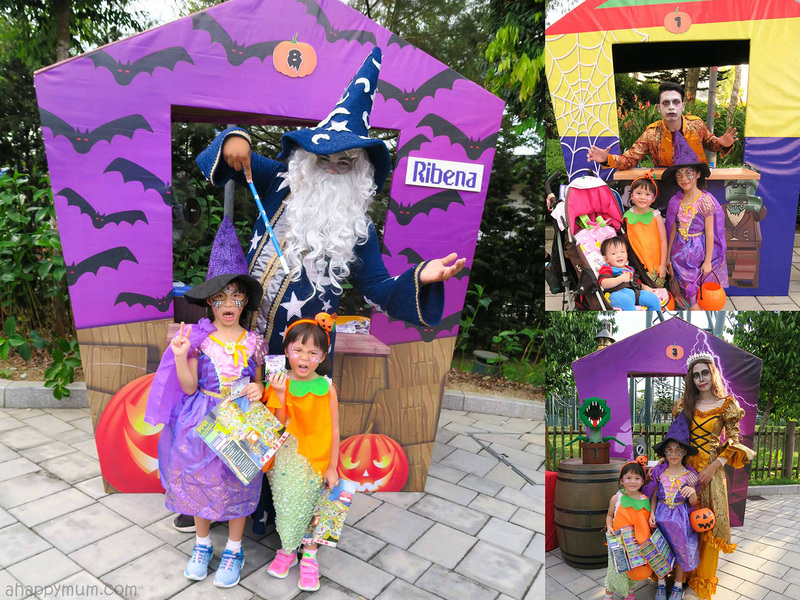 LEGOLAND Malaysia Resort reserves the right to reject any non-qualified costume. While the Halloween activities take place till 9:00pm, note that not all of the rides will be extended. 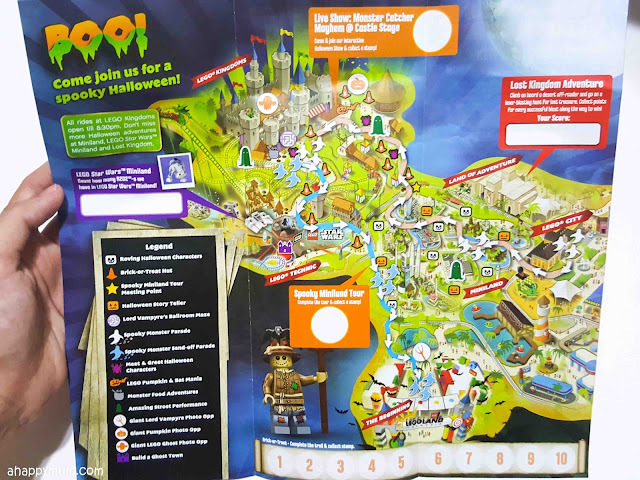 Areas that are open during Brick-or-Treat Party Nights until 8.30 pm include rides at LEGO Kingdoms, Miniland, Lost Kingdom and LEGO Star War Miniland. This was definitely what the kids were most excited about! 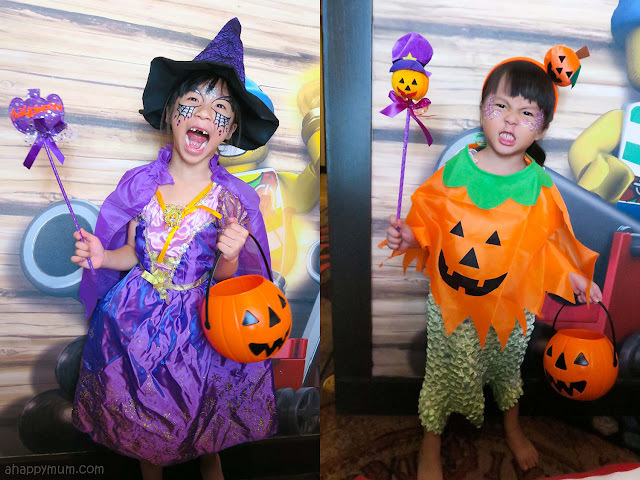 Presenting to you Angel the Rapunzel Witch, Ariel the Little Mermaid Pumpkin and Asher the Superbaby Devil. Cute? I love, love, love this picture and was glad I managed to take a few shots before the baby started yanking off his cape. Haha. As for the girls, they were simply ecstatic to dress up! We were so enthusiastic that we even packed wands, hats, hairbands and pumpkin buckets into our luggage and lugged everything here on our own. A few people have asked us about the 'make up' on the girls and well, they were simply decorative stickers we got from Daiso. Easy to put on, easy to remove! It just makes you feel so much more in the Halloween mood, doesn't it? Located at the LEGO Kingdom, the Brick-or-Treat Trail consists of 10 huts and all you have to do is collect all the 10 stamps on your trail card (which are distributed to kids at the entrance) to receive a commemorative brick. I thought the brick design was really cute! While we were told that there were activities and games at the huts, for instance laugh like a witch, ring toss and memory games, this did not happen in our case and the only thing we did was to count the number of bats hidden in the maze at Lord Vampyre's Castle. Other than that, it was basically just collecting stamps and goodies from the staff who were all dressed up for the Halloween theme. I did wish that they could have participated in more hands-on activities as I vividly remember they enjoyed laughing like witches and standing like scarecrows last year. So, I've provided feedback to LEGOLAND and hopefully other kids have a chance to do the fun tasks when they explore the trail. This will, however, be dependent on the circumstances and the crowd for the day itself. There is also a Scream-O-Meter where you can donate RM$1 to charity and then give your loudest scream. The one who has the highest number on the meter will stand to win a grand prize. No, my girl squeaked like a mouse and will never stand a chance. So what do you do when your kids are all dressed and you have plenty of beautifully decorated backdrops and roving mascots? You take lots and lots of pics, of course! You can take pictures at the huts with the crew in their monster costumes, you can pose with the props and you can take as many shots as you want with the cardboard figures and Halloween setups. One of my favourite character was the Pumpkin man on stilts, how cool, right? Also, check out the humongous pumpkin made of LEGO bricks and the prison wagon below! 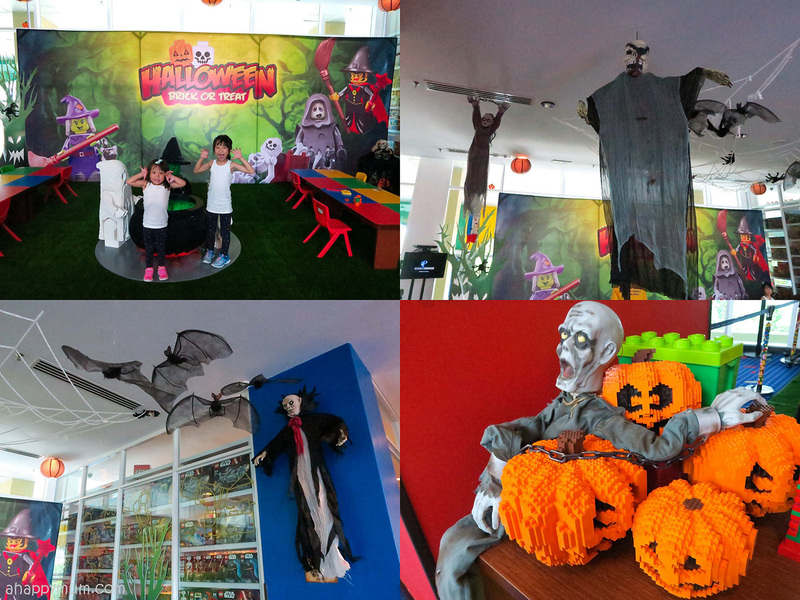 I must say that the organisers did a fine job in decorating the place and creating the Halloween ambience all around. You can find backdrops not only in LEGO Kingdom but also in many other spots all around the theme park too. I was tickled that Ariel asked to take photos every time she saw a....... pumpkin, of course! When night falls, it gets even better as the pumpkins illuminate the park and create a more spooky, but not scary, atmosphere. This is one of those nights where I think it's cool to let the little ones stay up and enjoy what the fun-filled evening has to offer. After all, we're on holiday, right? Wait, in the first place, my kids sleep at midnight, so it doesn't matter to me. This was the most enjoyable for us because the kids really loved watching the live Halloween show, Monster Catcher Mayhem, that took place on Castle stage in LEGO Kingdom. There were two fun-loving, lively emcees who were the monster catchers and had to capture Lord Vampyre, Green Witch and Frankenstein. The whole show was very interactive because they engaged the little ones in the audience and got them to participate along the journey too. Now, if your kids like things to be a little more creepy, then be sure to watch the Monster Parade where you can see all the monsters up close and join in their dance too. I must say their makeup was quite impressive and they even made eerie expressions and ghostly gestures to bring up the spook factor. If your kids are a little freaked out by it, do assure them beforehand and watch it from afar if possible. For my girls, well, they were right there in the first row and nope, they didn't even twitch, especially the little sister who is the braver of the two. If you have some spare time, find a place to sit down near the Castle Stage and let your kids learn to build some pumpkins and bats out of LEGO bricks. 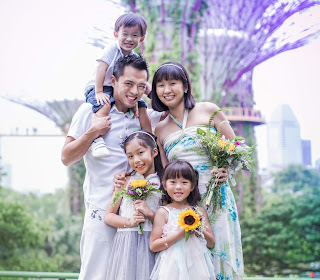 Step-by-step instructions are provided so this can be a really fun bonding activity for parents and kids! For those who love face painting, then don't miss the chance for them to get some colour and Halloween related drawings on their faces for FREE! We gave this a miss because the girls had plenty of glitter and gems on their faces already. And if your kids love to decorate cupcakes, then you can top up a small fee to let them do it at King's Grill. You can choose from vanilla or red velvet flavours and the best thing is they give lots of toppings for the kids to decorate with (and play and eat in the process too)! Since the activities take place till late evening, why not consider staying a night at LEGOLAND hotel? I tell you, my kids love this place so much that they probably wished they could live here forever. 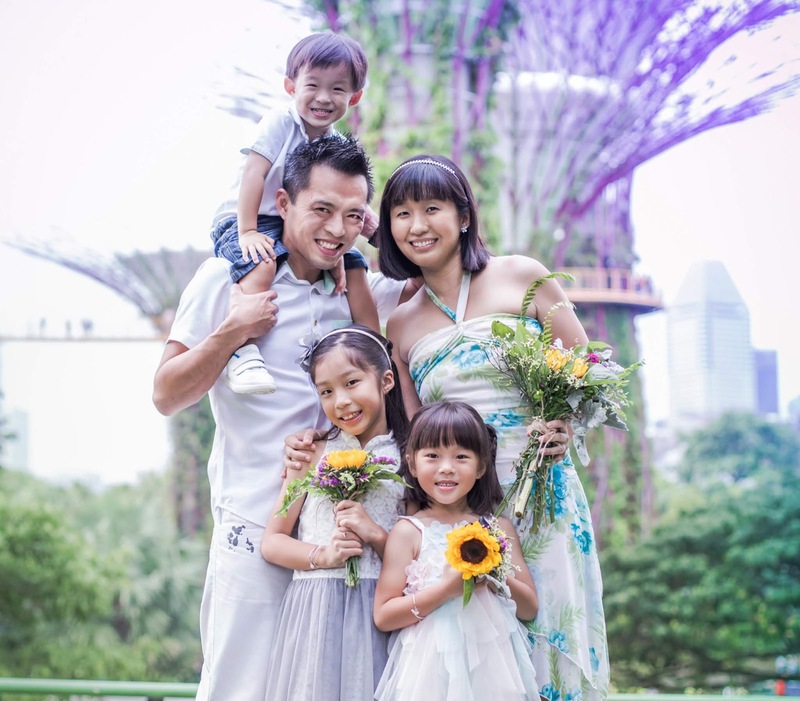 From the themed rooms to LEGO play areas to the fun dancing on Xbox Kinect and sumptuous buffet spread at Bricks Restaurant, it is a perfect place for a family retreat. To make your booking online, go here. We loved the Halloween corner that greeted us at the lobby level as well as the various decorative touches all around the hotel. There were zombies hanging from ceilings, draculas hidden behind walls, bats flying around and pumpkins placed all over. 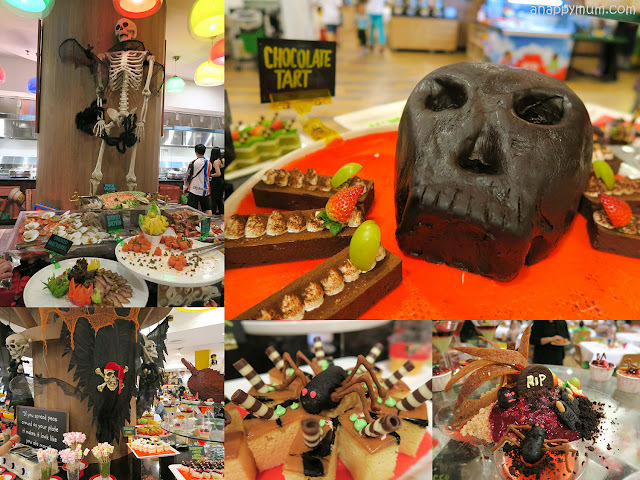 Even the food and desserts at the buffet dinner at Bricks Restaurant were in line with the Halloween theme too! Check out the black skull, spider, skeleton and tombstone! 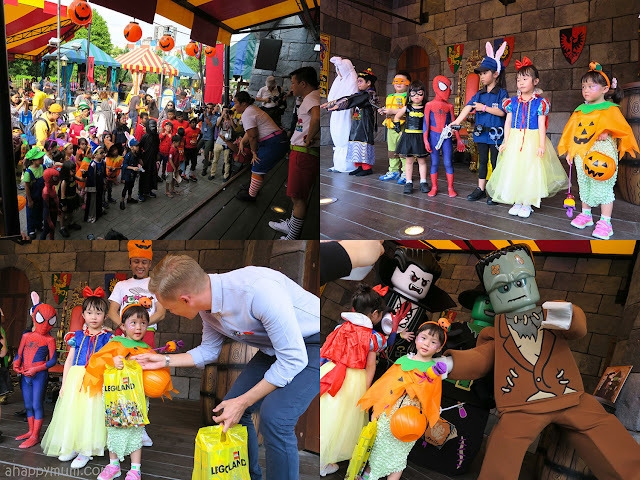 There was also a Halloween show that took place at the lobby and kids were invited to join in the activities such as searching for hidden items, building pumpkins out of LEGO blocks, opening locks with secret keys and mass dance sessions too! So, if you are thinking of a kid-friendly way to celebrate Halloween this year, do consider making a trip to LEGOLAND and join in the activity-packed and fun-filled Brick-or-Treat Party Night! Don't forget to dress up the kids in their best Halloween costumes and let your hair down, get wild, dance, scream on the rides and just be merry! 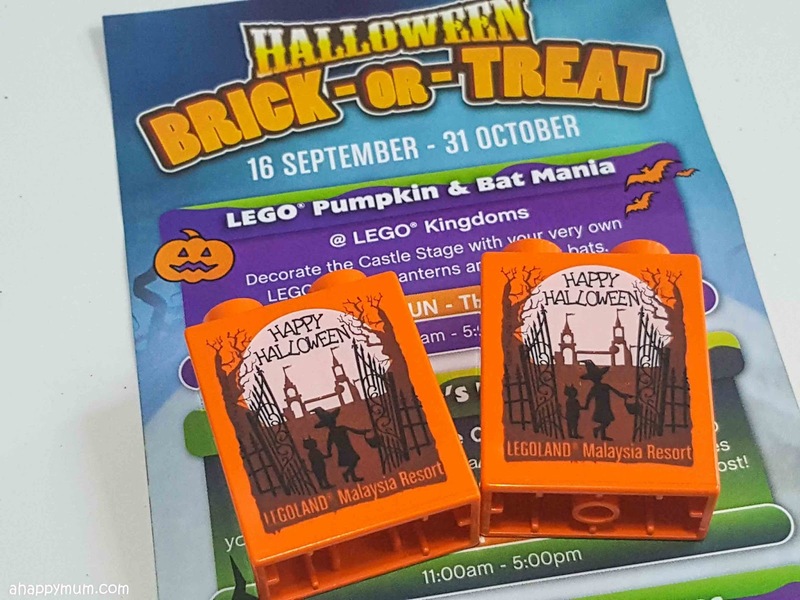 Disclosure: We were invited by LEGOLAND Malaysia to experience Brick-or-Trick Party Night and received complimentary park tickets and one night stay at the hotel. All opinions are our own.